A report of the NAIA All Star game, which featured long-time Grace College men’s basketball coach, Jim Kessler, as the East team coach, is found on the Victory Sports Network site. A portion of that report appears below. Click here to read the complete article. This year, the NAIA conducted their All Star game on Tuesday evening as a kickoff for the National Championship game. 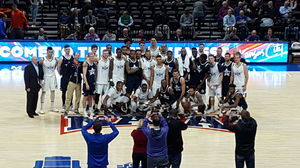 Players from NAIA Division 1 and Division 2 teams from across the country, and one from the Virgin Islands, were brought together in an East vs. West format. A big part of the event, though, was the coaching staff. The head coaches were two legends of the game: Jim Kessler of Grace College in Indiana for the East, and Bob Burchard of Columbia College in Missouri for the West. Both are retiring this year and received the honor of coaching one more time.